"Abraham Lincoln", Early life, University of Kent, Fair Use. When Abraham was eight years old, his family moved to a settlement in Indiana. Life was even harder here and, when Abraham was nine, his mother died of an illness known as “milk sickness." The family missed her dearly, and Abraham’s father found that he could not raise his two surviving children alone. He soon remarried; his second wife was Sarah Bush Johnston Lincoln. Sarah and Abe now had a new stepmother and three new step-siblings. Sarah was a very loving person; the family home became a happy place (as it had been for the Lincoln children when their mother was alive). Besides working hard on his land, Abraham’s father loved gathering with friends at the general store or around a campfire and spinning yarns and telling tall tells. So did Abraham. In fact, that was reportedly the one main thing Abe and his father had in common. Thomas Lincoln, a hard-working frontier man, had little use for education and thought it was a waste of time. He only allowed his young children to attend school for two years—but—Abraham used that short time to become a good reader. Among other reasons, young Abe loved reading because it opened up worlds beyond his log cabin. He especially loved to read about George Washington and Thomas Jefferson—both of whom he greatly admired. Although his father often criticized him for reading so much, his step-mother recognized that Abraham had a sharp mind. She helped him to find books that he read, by candlelight, after long days of work. As he grew to be a teenager, Abe became very popular in the small settlement in which he lived. His skill with an axe was well known, and his talent for storytelling was legendary. Men in Abe's community would often gather in the fields to hear and debate interesting opinions about politics and other matters. Abraham’s father would stalk into the group and drag his son out, boxing his ears for shirking his work. But Abraham never shirked his work. He grew to dislike his father but knew that he was duty-bound to help his family until he turned 21 years old. Often, after Abraham finished his own work, his father would hire him out to other farms and would keep all his salary. Abraham could hardly wait until his 21st birthday—when he could be on his own—but just about that time his father moved the family to Decatur, Illinois. Abraham told his father that he would help them move, and help them build a new log cabin, but would not stay there after that. 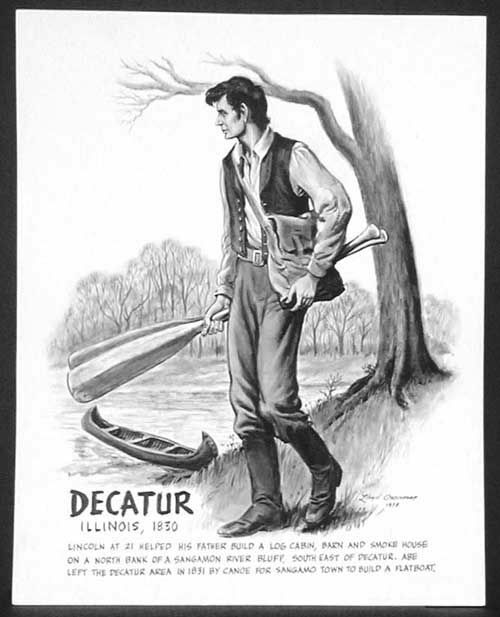 Shortly after their move to Decatur, circa 1830, Abe left his family to make his own way in the world. Kay Teehan "Growing Up Lincoln" AwesomeStories.com. Mar 22, 2017. Apr 26, 2019.